This collection was specially selected from the lists of words sent to us by Magnetic Poets from around the world. Using these suggestions, we've created The Poet Kit, a set of over 300 words perfectly suited for creating evocative lines of poetry. This magnetic muse is guaranteed to spark your imagination and give you the voice of The Poet. 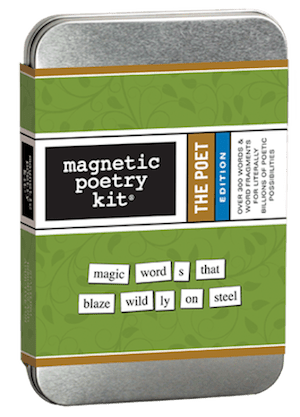 The Poet Kit contains over 300 magnetic word tiles and re-useable storage tin. Word tile height is .375". Package size is 4.5w x 6.5h x .875"d.